When the warm weather hits, you get the urge to go out and get active. You also want to dress in bright, stylish colors. The Invicta Angel (1295)meets both these desires. 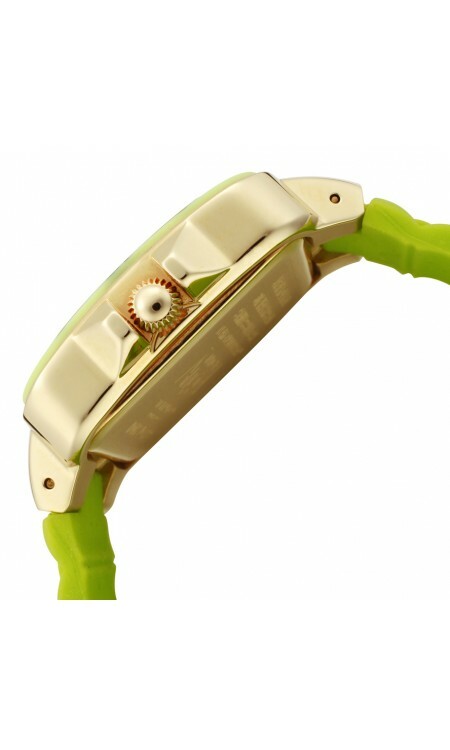 It’s brightly colored band and classy face give a stylish appearance to an otherwise sporty watch. 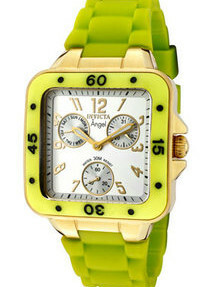 Made in Switzerland, the Invicta Angel (1295) is a women’s sports watch with a stylish appearance. This analogue timepiece has an expensive look and feel and typically retails for $425.00. However, it can be found online for $89.00 or even $69.99. I’d recommend checking Amazon or worldofwatches.com. The Angel’s stainless steel case measures approximately 30mm tall, 30mm wide, and 12mm thick. This leaves around 25mm for the dial. The dial is a light white with gold, arabic numerals and hands. Framing the dial, black arabic numerals mark 15, 30, 45, and 60 minutes with orbs marking the minutes between. The buckle style bracelet clasp is plated in 18k Gold. This combines with its bright yellow color to jazz up the rubber bracelet. The Case Measures approximately 30x30mm. 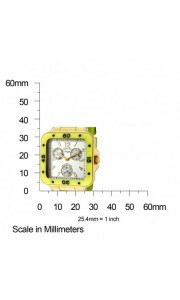 Its 18k gold plated case, bright dial and strap, and square case catch eyes and compliments. The Invicta Angel (1295) is more than just a stylish accessory though. This well crafted watch has quartz movement which keeps precise time. Invicta’s trademark crystal flame-fusion makes the watch more impact resistant than others. The watch is also water-resist down to 30 meters (99 feet). Its durable, rubber band flexes with you, making it a comfortable fit at the gym or out on the town. Women with less than perfect vision may find the sub-dials difficult to read. Black numerals give them a visable contrast, but their small size can still present problems. The gold numerals on the main dial can tend to blend in with the white dial as well, though the hands generally stand out well. While the yellow color helps jazz it up, some women may prefer a bracelet made of something more stylish than rubber. If you don’t intend to wear this watch to exorcize and prefer a more expensive look on more than just the face, this is probably not the watch for you. While the color may not go with everything in your closet, the style is certainly versatile. If you’re looking for something to wear to the gym that can also follow you to work or out shopping, this is an excellent choice. This is where class meets quality. The Invicta Angel (1295) merges style with sports-ready durability, making it an excellent choice for fashionable, active women. It’s cheerful color scheme makes it a delight to wear, especially in the warmer months, and it’s a steal at $89.00!